1. High hopes for Netflix: Netflix(NFLX) is set to report first quarter earnings after the closing bell on Monday, and Wall Street is expecting a blockbuster. TheBritish CEO announced his departure in a letter to WPP(WPP) employees Saturday. The company said earlier this month it had hired an independent counsel to conduct a probe into the alleged misconduct by Sorrell. The hunt for a successor starts now. Sorrell spent three decades building the company and analysts are worried he will be hard — if not impossible — to replace. WPP shares fell nearly 2% in early London trade. US Ambassador to the UN Nikki Haley told CBS Sunday the Treasury Department will announce new sanctions against Russia on Monday. She said the sanctions will go “directly to any sort of companies that were dealing with equipment related” to Syrian President Bashar al-Assad. Russia’s parliament could vote Monday on retaliatory measures. 4. 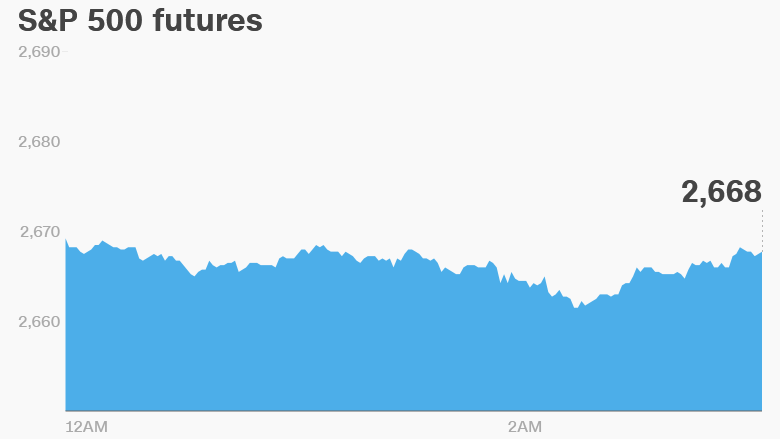 Global market overview:US stock futures were pointing higher early on Monday. “Many feared the attack would probably lead to a broader confrontation … the fall in oil prices is another sign of relief, after the geopolitical tensions last week drove Brent to its highest levels since 2014,” Hussein Sayed, chief market strategist at FXTM, wrote in a note for clients. Bank of America(BAC) is set to publish its latest results before the opening bell on Monday. Investors are hoping the bank will follow the trend set by rivals JPMorgan Chase(JPM), Citigroup(C) and Wells Fargo(CBEAX) — all three reported earnings topping analysts forecasts on Friday.